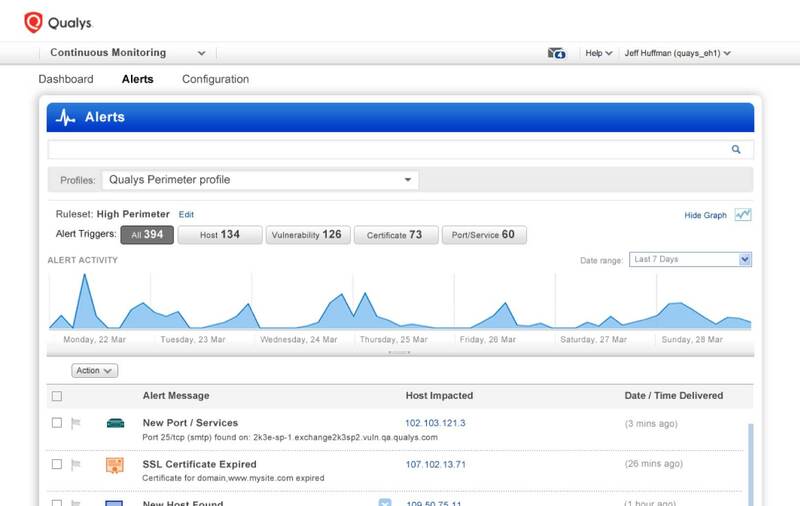 Continuous Monitoring | Qualys, Inc.
Alerts you in real time about network irregularities. The Qualys Cloud Agent helps our medical center improve its vulnerability management efforts and achieve the real-time, continuous security the security team sought. CM works in tandem with VM so that, from a single console, you can discover hosts and digital certificates, organize assets by business or technology function and be alerted as soon as vulnerabilities appear on your global perimeter. With CM, you can identify and proactively address potential problems. CM lets you see your perimeter the way hackers do — directly from the Internet — and acts as a sentinel in the cloud, constantly watching your network for changes that could put you at risk. CM automates monitoring of your global perimeter, tracking systems in your global network, wherever they are. Alerts can be tailored for a wide variety of conditions impacting systems, certificates, ports, services and software. Each rule can be configured to detect common, general changes or tuned to very specific circumstances. You can assign different recipients for each alert, so that the appropriate person is notified. The dashboard displays your network’s big-picture status at a glance, giving you a graphical representation of recent activity to spot anomalies. You can flag important alerts or hide trivial ones. A search engine lets you find specific alerts and drill into details with one click. 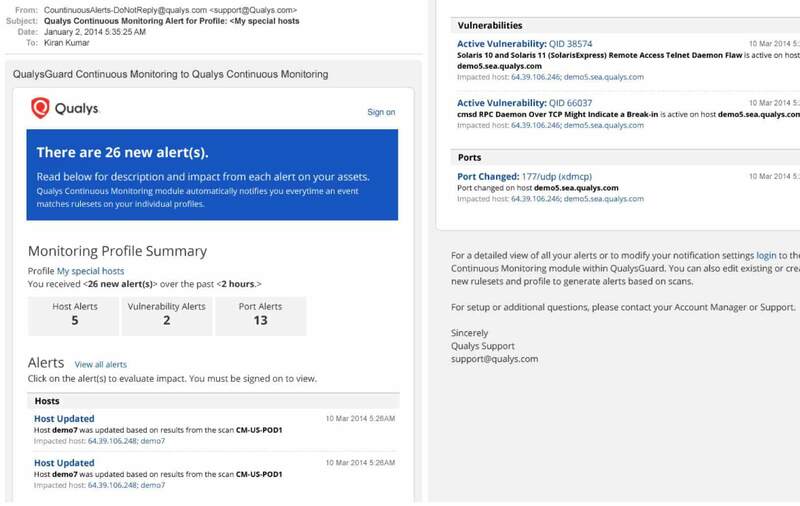 The deep, native integration between Qualys Continuous Monitoring and Qualys Vulnerability Management generates a new approach to information security in which you continuously identify and proactively address potential problems, instead of waiting to respond to incidents. For continuous monitoring and quick detection of security and compliance problems to be effective, it’s also necessary that the appropriate staffers be notified, so that prompt action can be taken. Email notifications feature intuitive layouts and are rich in context and content, giving recipients a succinct yet complete account of events. Email notifications display the number of new alerts for each category in your selected timeframe. Alerts are also grouped by category. For each alert, you will see the impacted host’s IP address and hostname as well as other event specific details, such as the vulnerability detected, software added or open ports. See the results in one place, in seconds. With AssetView, security and compliance pros and managers get a complete and continuously updated view of all of their IT assets — from a single dashboard interface. Its fully customizable and lets you see the big picture, drill down into details, and generate reports for teammates and auditors. Its intuitive and easy-to-build dynamic dashboards aggregate and correlate all of your IT security and compliance data in one place from all the various Qualys Cloud Apps. With its powerful elastic search clusters, you can now search for any asset – on-premises, endpoints and all clouds – with 2-second visibility. Centralize discovery of host assets for multiple types of assessments. Organize host asset groups to match the structure of your business. Keep security data private with our end-to-end encryption & strong access controls. 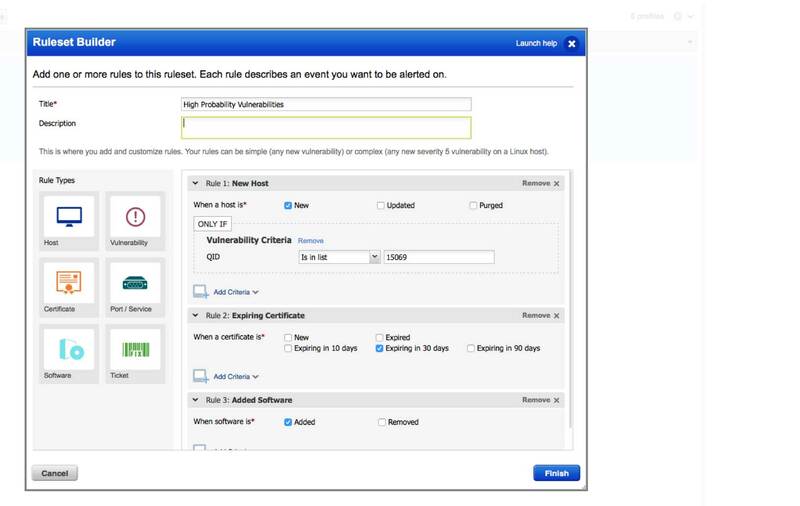 You can centrally manage users’ access to their Qualys accounts through your enterprise single sign-on (SSO). Qualys supports SAML 2.0-based identity service providers. Deploy from a public or private cloud — fully managed by Qualys. With Qualys, there are no servers to provision, no software to install, and no databases to maintain. You always have the latest Qualys features available through your browser, without setting up special client software or VPN connections. Scale up globally, on demand. Integrate with other systems via extensible XML-based APIs. You can use Qualys with a broad range of security and compliance systems, such as GRC, ticketing systems, SIEM, ERM, and IDS. See for yourself. Try Qualys for free. Start your free trial today. No software to download or install. Email us or call us at 1 (800) 745-4355.